And of course today is Black Friday. I stayed up plenty last night in the comfort of my own bed browsing all my online spots and trying to get a deal on some Alexander Wangs or Phillip Lims. While there were great deals, I didn't end up finding something I really wanted :( Did you end up getting any thing amazing? 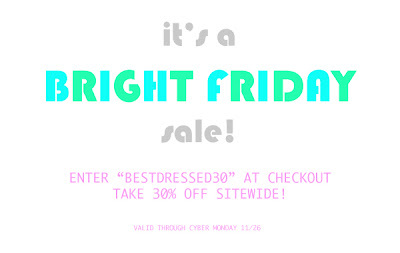 On a side note, LAST NIGHT is having a bright friday sale with 30% off all dresses until the end of cyber monday! Enter code "BESTDRESSED30" at checkout. What a gorgeous dress,love the cut,you look so pretty! Okay, that dress is perfect! You look so stunning. I didn't do any shopping today. I did the opposite actually, and made some money babysitting. The dress is so cute, I love the cut-out detailing in the front, Topshop has a similar one, it's little details like these that makes an outfit pop :) xo PS ~ Love the fuscia lippie looks great! hello! where do i shop for a wang for black friday sales?